I had, quite possibly, one of the Best Weekends Ever. It didn't start well on Friday ... and the traffic this morning has already rubbed off some of my silly grin. Which is a pity. On Friday I was working from home because I had a flight to catch and didn't want to include traffic time into my day. Unfortunately as I started to check my emails at 6:45am ... the power went off. And no, we weren't scheduled for load-shedding (it was only supposed to be 6-10pm in the evening, regardless of Stage). Aaargh. Thankfully The Trucker left me with his 3G (Telkom adsl & router are useless with no power) and I worked till 9am when my laptop battery gave up. There was still no power and no response from City Power Jhb. So I packed up my stuff and found a table at the nearby Doppio Zero. I wasn't the only one. It's an expensive day out, sitting somewhere like Doppio to work. But by 12h30, The Trucker told me the complex had power again and I headed home. We had power till 2pm, but luckily I still had a fully charged laptop and managed to work till I needed to head to Lanseria. Daddio collected me at Cape Town airport and took me to Mom's house where I'd be spending the weekend. She'd made dinner, but was being load-shed at the time. Luckily she has a gas stove and made a plan! At least while I was in Cape Town the power went out as it was actually scheduled to! Saturday was my (first) Baby Shower :) I got kicked out of the house around 10h30 so that my Mom, sister and cousins set up and prepared. Daddio came to collect me and took me to collect my Birthday Painting. Then we did a little shopping, went back to his house, had lunch and I got ready. I arrived a little early and was wowed with the effort they'd all put in! The Littlest One's nursery has a dinosaur theme and they went all out with the decor and snacks. I was so impressed! There were dino footprints from the gate entrance into the house. 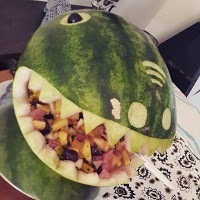 There was a fantastic watermelon dinosaur head filled with fruit salad. 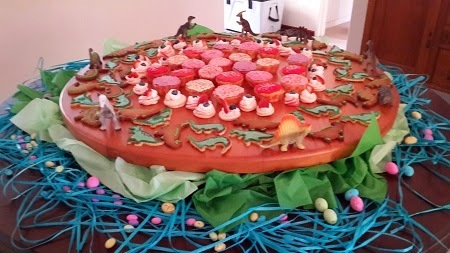 There were dino biscuits and a giant painted (by my cousin) Dino on the wall. It was amazing. 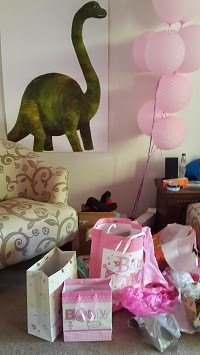 It was a mix of family and my Cape Town friends and it was wonderful to see everyone :) My little girl got so spoilt with gifts! And all the knitting The Peeb has been doing since the day she found out I was pregnant was amazing to finally see! Oh the cute things. There was too much to mention everything, but it was awesome and I feel so blessed that my baby and I are so loved. Daddio popped over in the evening to see everything. It's weird to think I won't see him again before she arrives! Yikes. There are so many things like that now. These were my last ever Before Baby flights. Hahaha. On Sunday mom & I had a lazy morning and somehow I managed to pack everything (except the painted dinosaur) into my big bag. My flight home was delayed but I was thrilled to see The Trucker, I couldn't wait to show him all the cute little things we'd got! But he had other ideas. When I walked into the house, the first thing I saw was that he'd put the tiled splashbacks up in the kitchen! I've been wanting them for ages and it is so awesome and makes such a difference :) I was thrilled! It had sounded like he'd had a pretty ordinary relaxed weekend but clearly he'd been busy. I didn't realise just how busy till he asked me to go turn the fan in the Nursery (always a closed door due to the chaos lurking behind it ... it's been upsetting me every time I opened it. But we've been away the last 3 weekends and scheduled next weekend to sort thru it all). OMG I was completely speechless when I opened that door! It still blows my mind just thinking about it! He had sorted thru the whole room and turned it into a nursery. It's all her stuff and he painted it just the way we'd planned. All while I was gone! He even got some help from his friends - I have no idea when he planned and organised all this! And he went and bought the chest of drawers we'd picked out (a gift from my grandmother). That meant that the shelves in the garage had also been put up (that's what we were waiting for so that we could sort out the nursery). You guys! It is so so fantastic. I can't even explain how my heart spent the rest of the afternoon just exploding. I am so excited. There are still little things to do ... which I am looking forward to. Now we can assemble her cot and her pram. Put up some shelves. And I also have a lot of sorting out to do of all my stuff that was in there. But still. This is pretty freaking amazing. Amazing. 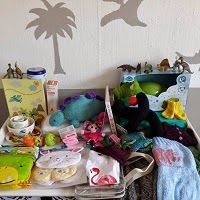 Love your fruit salad dino...and how awesome the baby room surprise!